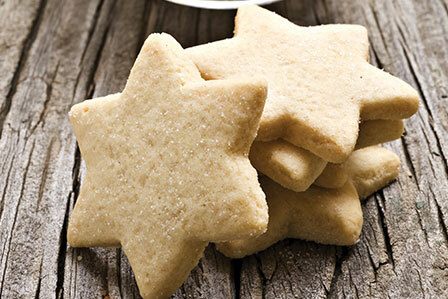 Try our recipe for crumbly, buttery, melt-in-your-mouth Almond Shortbread, perfect with a cup of tea! Preheat oven to 160°C/325°F/gas mark 3. Beat butter and sugar together until smooth. A wooden spoon or electric mixer may be used! Add the flour, cornflour and ground almonds. Mix gently until a dough is formed. Use your finger tips to form dough into a ball and lightly knead, if necessary. Press dough into a greased n8”/20cm round. A sandwich tin may be used. Prick around top of dough with a fork. Bake for 20 minutes or until very pale in colour. Allow to set in tin for 5 minutes, then transfer to a wire rack to cool. Slice or cut into shapes. For biscuits, roll out mixture on a floured surface and cut out shapes or rounds using biscuit cutters. For fingers, press dough into a 7”/18cm square tin and cut into fingers after baking. Perfect accompaniment to a cup of tea or coffee! Next PostNext Early morning winter. Powerscourt Co Wicklow.